Today I had my high school class, which meant I had to prepare for it, plus do school with Jasper. I also went out and bought more candy, because the stash I originally got to have on hand for tomorrow has taken a rather serious hit. For supper I had hoped to make a pork curry, but when I looked at the recipe I realized that I didn’t have several key ingredients. So I just improvised and made up my own version of curry with what I had on hand. It was very delicious! I guess I will hang on to that recipe. This evening I was busy working on a project for Lucy. Yesterday at the thrift store she got a navy blue evening gown. It was for someone approximately the size of a broomstick, but it did have a flared full skirt, which I was able to cut off. I cut the upper part of the skirt into strips to make a waistband and now Lucy has a navy satin skirt to wear as part of her costume for tomorrow. She is going to one of those “murder” mystery dinners so she has to dress for her part. Tomorrow morning we’ll finish working on it. My kids don’t realize how lucky they are to have a mom who can just make them stuff on short notice! Oh, and I actually posted to my writing blog today. There is a link to it on my “links” page. Today was a pretty normal school day, I guess. This afternoon I took Lucy to a couple of thrift shops to look for a costume piece. She did eventually find something she can use, and I came home with 10 more punch cups. We also had piano lessons and after I took Lucy to youth group I stopped at Hobby Lobby for a few craft items. Now all I need is time to make stuff! I managed to do three breathing treatments today and I think it is helping. I hope I feel a lot better before I run out of the medicine! As I was preparing to write this post, I saw a news headline that the president of Zambia, Michael Sata, has died. What a tragic postscript to the celebration of the country’s 50th birthday. Please pray for a peaceful transition to a new leader for the country. Today was my belated grocery shopping day. Poor Jasper thought he had to wait till I got home to have breakfast, so we ended up having “brunch” and then not being hungry for lunch! I was having another bad sinus day so this afternoon I went up to the medical supply place and got masks to go with my nebulizer. I hate the thing you have to clamp between your teeth! I did a treatment before going to my meeting and another after getting home, and I do feel somewhat better now. I was half an hour late to my critique group meeting because I had the time wrong in my head. I’ve been very wrong-headed lately, to be honest. Anyway, it was a good critique group meeting and I got some good feedback. Afterwards we had our regular monthly writers’ meeting and it was excellent. Our speaker was Nancy Masters, a writer from west Texas. She was very entertaining and had a fun writing exercise for us to do at the end. I bought two of her books and may order a third online. I don’t know what I’d do without my writers’ group. I really need that monthly dose of encouragement. It used to be that other homeschooling moms were “my people.” But to be honest, I don’t really feel that welcome or accepted in a homeschool group anymore. 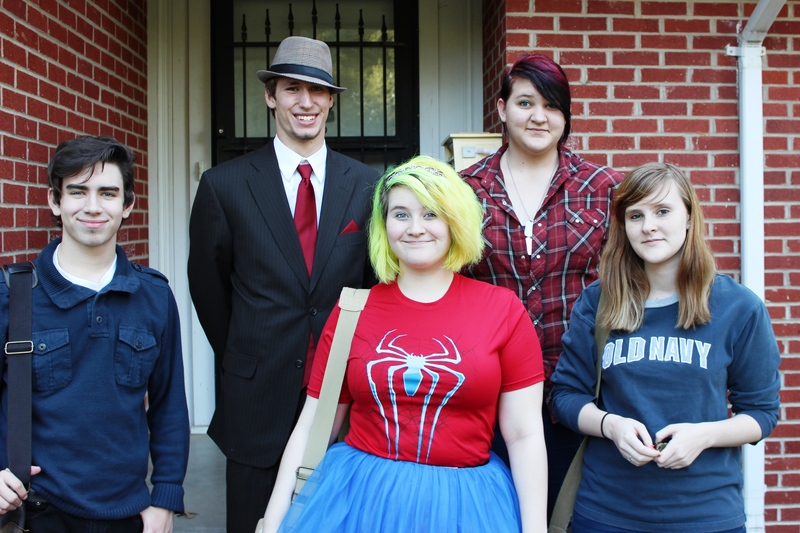 Ten years ago I used to look forward to our monthly homeschool group meetings. Now I don’t even attend. Instead I look forward to my writers’ group meetings. The big question now is: to NaNoWriMo or not to NaNoWriMo? So, you know your weekend was exhausting when preparing for and teaching two classes on Monday is actually a bit of a break. After the long day at the conference on Saturday, I still had to practice the hymns for Sunday. I didn’t feel at all confident about playing them, but I was thinking the whole time, if I’m really bad then I can just sort of stop playing and let Israel (the violinist) carry it. When we walked into church I was relieved to see that Israel was there and had his violin with him. During the break between services I set up and played through the hymns very quietly. When it was time to sing the first hymn, I went ahead and started, expecting Israel to join in at any moment, but he didn’t. To my horror, I realized that I was on my own. Fortunately, it didn’t go as badly as I expected, and the second hymn went okay too. Whew! Oh, and you know why Israel didn’t play with me? Because I forgot to email him and tell him what hymns I was working on and in what keys! Duh . . . The afternoon was very busy with getting ready for our Zambian Independence Day celebration. The “relish,” or sauce that I was making started with some chicken stock and two large bags of greens. After the greens cooked down a little, I was able to add the other ingredients to make about two gallons of relish. Jasper and I also made another chai flavored pound cake with chai icing. I cooked a huge pot of rice in case anyone didn’t want nshima. I also made the mandazi dough and then Lucy spent two hours frying up all the mandazis. I was so busy doing all that other stuff that I failed to start the nshima water heating until after our first two guests had arrived! I had asked guests to bring relishes, drinks and desserts. We had four different relishes and they were all delicious. I had several college-aged young men to stir the nshima, and they did a great job. It was almost four gallons of very stiff nshima and took a lot of muscle! 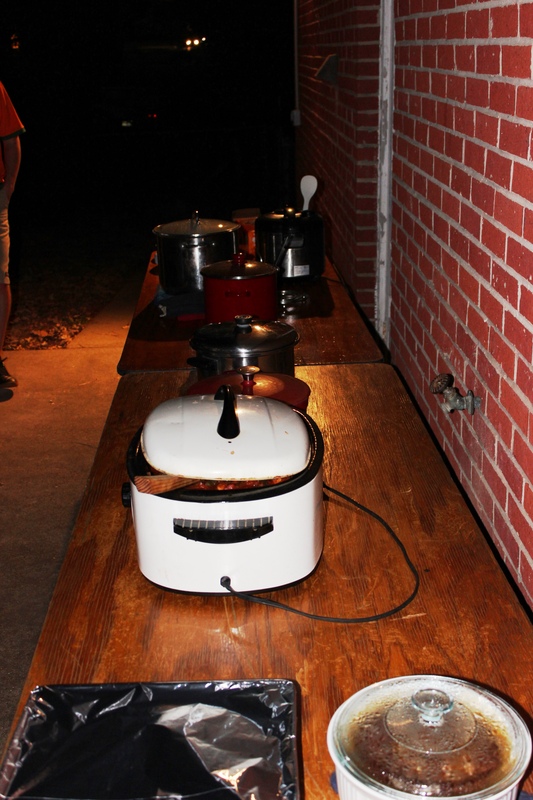 Walter had set up a long table outside. I think we had between 20 and 24 people. Honestly, I never counted. I was especially happy that our friends PJ and CO came. PJ and I go back to Zambia days, at least 40 years, and CO and I met in high school in Kenya. We live in the same town but move in totally different circles now, so we just don’t see each other. Our neighbors Kim and Kevin came with their family. Kevin grew up in Zambia and Zimbabwe. Our neighbors Dave and Sylvia, whom we have known since college days and who went to Zambia on a mission trip this summer, also came, along with various college students with Zambia or Africa connections. How likely do you think it is, that in a little neighborhood in East Texas, an MK from Zambia like me would have a neighbor across the street who also has a Zambian background, and another neighbor (with whom we share a fence) who went to Zambia this summer? Not to mention the fact that another neighbor is from South Africa and a couple blocks down is another couple who both grew up in West Africa? After our fabulous dinner, I got out my autoharp and we sang the Zambian national anthem, and I think it went pretty well. Shortly after that people started leaving because they had to get up early in the morning or do homework. 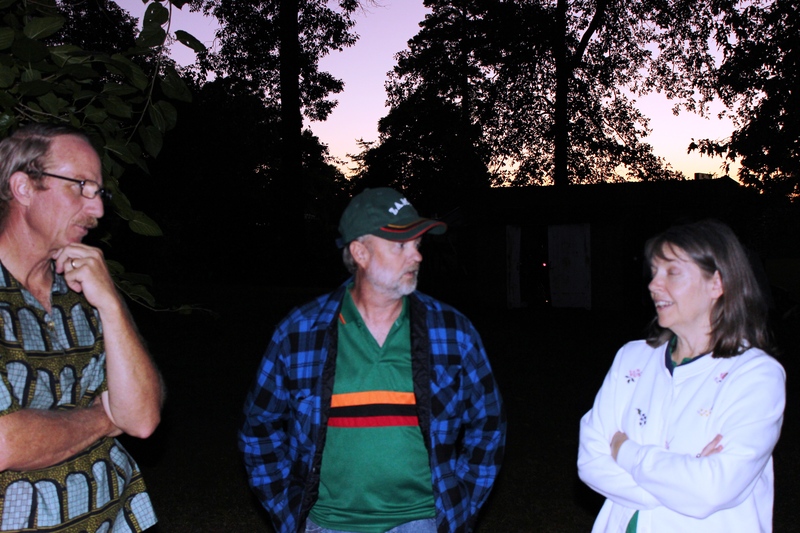 It was so much fun to see everyone and celebrate Zambia’s 50th birthday. Today, of course, I had to get up and try to cram all my class preparation and grading into one morning. It was a little stressful, but I did get it done. It was fun hearing the stories that my students had written. I’m amazed at some of the things they come up with. Now to plan out the rest of my week . 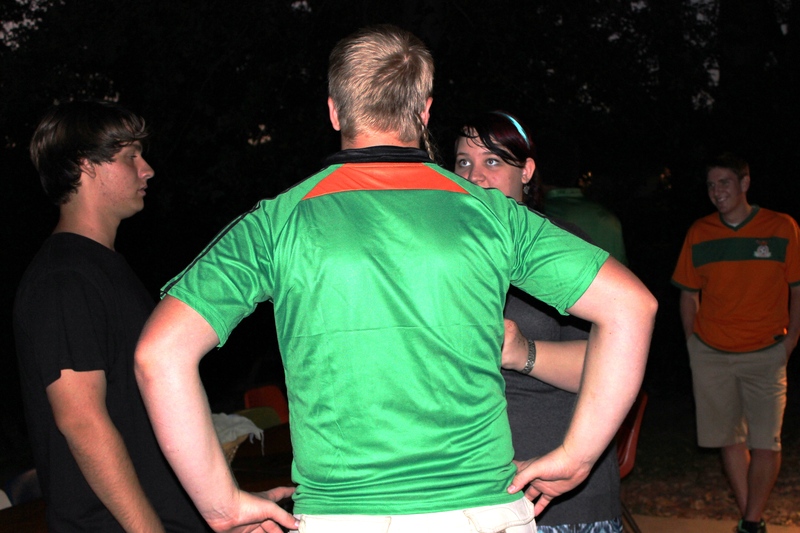 . .
Spencer wore a Zambian soccer jersey, as did some of our guests. 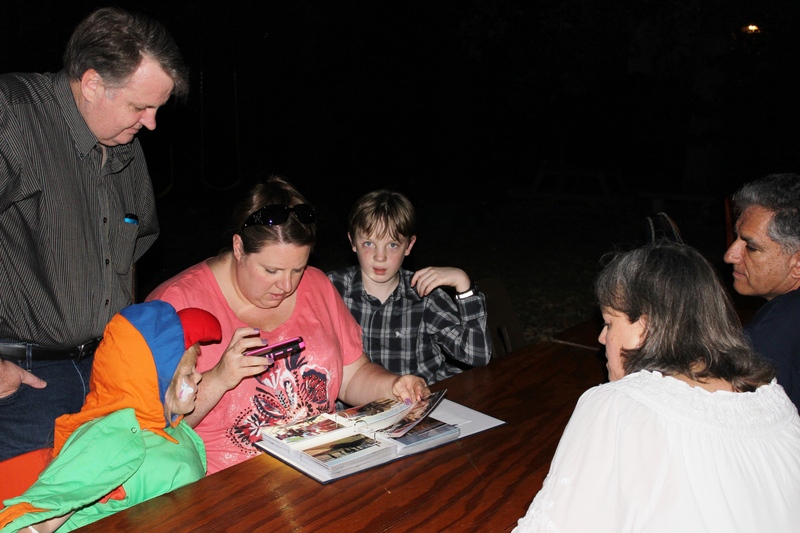 Kim and Kevin got to look at Sylvia’s photos of Zambia from this past summer. 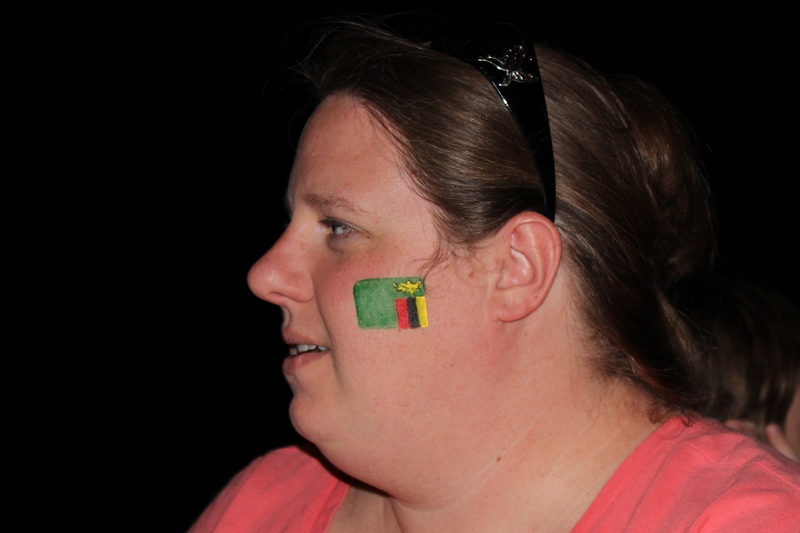 Kim had actually been to an event where she got the Zambian flag painted onto her cheek! We sang this in church this morning. I really wanted to learn it for the autoharp and my teacher helped me work the chords out. Today I did something that Lina did every day for the four years that she attended classes at East Texas Baptist University. I drove east into the sunrise this morning and returned home with the setting sun blinding me this evening. I couldn’t find my sunglasses so it was especially challenging. I had timed my arrival at the campus this morning to be early enough to get a good parking space, and I got one! So much better than yesterday’s remote spot. Then I had plenty of time to get my schedule in the student center and spend some time planning out which classes I would attend. I even had time for a quick cup of tea from my thermos before heading upstairs to my first class. The university has very strict rules about food and drink in the classrooms, which meant that I had to work really hard at staying awake during my first two classes. They were interesting, but not as inspiring as I’d hoped, so when the third period rolled around, and there weren’t any classes I particularly wanted to be in, I went back to the car and took a power nap until lunchtime. When I went into lunch, there wasn’t really anyone that I knew well enough to sit with, so I made myself a salad (the only gluten-free option) and ate alone while reading the first part of a book written by one of my young friends. It was very enjoyable. Things got a little better after lunch. After ingesting three different caffeinated beverages, I was more alert and all three of my afternoon classes were excellent and well worth my time. I don’t know why I’m kind of in a funk about my writing. I was kind of hoping that this conference would inspire and motivate me to dive into writing with renewed vigor, but that didn’t happen. I kept thinking, ten years! Ten years I’ve been at this and I’m still a wannabe. *sigh* Of course, the flip side of that is how can I give up after investing ten years in something that I still believe I can do? It’s kind of like driving into the sun. I can’t see the road ahead because the glare in my eyes keeps me from seeing anything except a few feet ahead. I keep driving and driving, but I don’t know if I’m getting any closer to my destination because I can’t see it. This evening I had to have a cram practice session with my autoharp, and I’m still feeling a little doubtful about playing tomorrow. I guess I’ll just have to do the best I can. I hate letting myself down, so I’m kind of grumpy right now because I feel like I let myself down. I had a hard time getting going this morning because I am still struggling with sinus stuff, but I did eventually get out to do the grocery shopping and then come home to start getting ready for the conference. I also celebrated Zambia’s 50th birthday by picking out the national anthem by ear on my autoharp. Hopefully I can get it down well enough to play it on Sunday when we have our celebration. Fortunately it’s a pretty easy tune. I ended up being in a big rush to leave, and I barely got to the university in time to check in before my first class started. I couldn’t get a parking space anywhere near the student center, so I parked on the far side of the dining hall, thinking at least I’d be close to where we had the dinner. 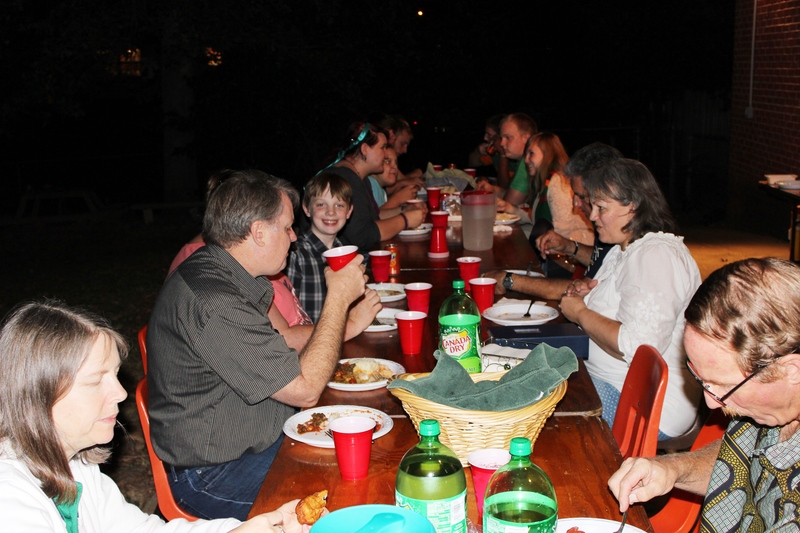 Wouldn’t you know it–they had the dinner in the student center this year! So anyway, the primary reason I signed up for today’s classes was to hear the keynote speaker. I went to her classes and although the content ended up not being at all what I expected, I did learn some valuable information. After the second class we had the dinner. I followed what has become an established pattern for me. I walked into the room, scanned the tables and did not see anyone I knew. So, I walked up to an empty table at the front and waited to see who my table mates would be. Slowly, the table filled up. Two sweet ladies sat on my left. Two faculty members sat across the table. The seat on my right was the only one unoccupied when the organizer of the event ushered the keynote speaker into that spot. It was not as much fun as you might think. I tried mightily to initiate and continue a conversation, and she answered my questions politely, but it was clear she would prefer to be left alone. The lady on my left, however, whose name I have already forgotten, was very interested to hear about my memoir and even wrote my name down so she could find my book in the bookstore. That made me feel a little better. I was dreading the moment when the winners of the writers’ contest would be announced. I knew my chances were not good. That week before the deadline was the week that I was so, so sick, and my brain was hardly firing on all cylinders, or even any cylinders. I knew the story I came up with was crapulent, not to mention trite and lame, but I was unable to think of anything that wasn’t just as bad. I felt a little better about my essay. I wasn’t feeling well enough to do it justice in the time I had, but I didn’t think it sucked and I thought it might scrape into third place if I was really lucky. I wrote a poem that was so abysmally bad that I added two others that I wrote while not sick, in hopes that they might have a better chance. So that’s why I feel like I let myself down. I feel like I should have knocked myself out working on my entries in the summer when I had a little more time and was not deathly ill, and then maybe I might have produced something worthwhile. At least I can be happy for the people who did win. Truly. I did not know any of the essay winners, but the story winner was a writing acquaintance of mine and in fact when I knew she had entered I thought it quite likely that she would win. Her story was also the grand prize winner. I know she’s a pro and I’m sure she earned it and I can’t wait to congratulate her tomorrow. I came home and put my feet up and did a breathing treatment because I’m still struggling with respiratory issues and in fact was coughing a lot today in class. Good thing I thought to stock up on cough drops. I’m determined to make the most of tomorrow and just focus on how to improve from here. It’s just a really good thing that when I sat down to write my first book ten years ago, I had no idea how much discouragement lay ahead of me. . . .
On Tuesday I really felt that I was mostly recovered from my sinus issues. In the wee hours of the morning on Wednesday I suffered a sudden and dramatic setback. In a matter of minutes I went from feeling mostly okay to feeling really, really sick. Didn’t see that one coming! So, yesterday was a pretty rough day, because sick or not I had to supervise Jasper making his second cake for the harvest festival, and then he still had to make the icing for both cakes and ice them. And my friend Robin was coming over to visit, and I hadn’t seen her in a long time, so I didn’t want to cancel. Clearly, the only thing to do was just drug myself through the day. Even so, I was not really functional for most of it. I did get Jasper through his cake making. I did enjoy my visit with Robin, though by the time she left I had a fever and I knew it. I drugged that too. I am actually pretty proud of myself for managing to drive Jasper over to the harvest festival to enter his cakes. After I got back home I could collapse. I was kind of glad Lucy wasn’t going to youth group because I wasn’t up to driving anymore. I was starting to wonder if I needed to cancel my class for today, and I was even more concerned about making it through the writers’ conference I’m attending this weekend. I’m sure you’ll be relieved to hear that by the time I went to bed last night, the fever was gone and I felt that I was improving. Today has been much better. I don’t think I’ve ever had such a sudden and severe relapse, and am so glad it only lasted one day. My remaining symptoms are manageable! So, I did have class today. I started the video and then had to leave to take Jasper to the harvest festival to see how his cakes did. Both cakes won blue ribbons! I am proud of him for working so hard on them and I know they were delicious because I created both of the recipes. Since the cakes are sold to raise money for 4-H, I think I’ll have him make another one of the chai cakes for an event we’re having this weekend. I wish I had thought to get a photo of Jasper with his cakes, but I was just thinking I had to get back home to my students before the video ended! Tomorrow afternoon I’ll be off to the writers’ conference that is held each year at Lina’s alma mater. This will be my third time to attend this conference and I know I’ll enjoy it because this is the one where I actually know people! I’m going to offer my memoir for sale in the bookstore–wouldn’t it be nice if someone bought one? I know someone is going to ask about the cake recipes. I’m way ahead of you. They’re already up on my recipe page. This morning it was a bigger struggle than usual to get up. I have begun having occasional nights when I don’t sleep well at all and this is very unusual for me. Normally I fall asleep almost instantly and stay that way till I have to get up. I had promised to take Lucy out to get coffee, and I had to stop at the dollar store anyway, so off we went in the middle of the morning. Despite having had a tall mug of very strong tea, I was struggling to stay awake enough to drive. Taking a nap when I got home was out of the question, so I had to resort to more caffeine. I did more school with Jasper and then did some autoharp stuff to cram for my lesson before leaving at lunchtime. It was such a beautiful and pleasant drive up there–I savored every moment of it. I had promised my teacher I’d bring the used autoharp I recently bought to start teaching the kids with. She agreed with me that it has a lovely sound, and she volunteered to help me rearrange it so the chords are set up the same as mine (which makes everything so much easier). Once again I got to cut some new felts and we ended up with a second autoharp that is just like mine. The fun can commence! The lesson itself was rather short. She helped me with a couple of hymns where I had a hard time finding the exact right chord in a couple of places. I proudly played my “C” scale for her. Now that I’ve got it just about memorized, I will tackle another scale for next time. These lessons are such an encouragement to me. I know I mess up a lot, but it is so helpful to know that I am still making headway and improving bit by bit. The demands of having to learn new songs every single week are a great way to stretch myself and learn new things. If I fall victim to dementia (heaven forbid), it won’t be because I let my brain lie around on the sofa and watch TV! This evening I supervised Jasper in making the first of the two cakes he’ll be entering in the harvest festival tomorrow. I’m so thankful we didn’t knock ourselves out to enter a ton of stuff like we did last year. Two cakes is plenty! Now, all we’re waiting for is for the travelers to arrive. Flynn, Mercy and Spencer left Mary’s house at lunchtime and should be arriving very shortly. The eerie silence of the last few days will be over! I’m really glad I did all that grading on Saturday, because I had more than enough to do this morning without it. I did some school with Jasper and prepared for my class and even picked a few new photos for story prompts and then drove to the drugstore to pick them up. Writing from pictures is something that most of my students enjoy, so it is a fun thing for me to teach. I am looking forward to seeing what they come up with. After my classes were over, it was time to work on stuff for my autoharp lesson tomorrow. One of my assignments was to come up with the melody chords for a hymn that I am fairly familiar with, but for some reason it was a huge challenge and took a lot longer than I expected. I’m still not sure I even did okay with it. I am also learning to play scales. Not as hard as I thought it would be, but I say that as someone who hasn’t actually memorized anything yet! This house seems so quiet and empty with only four people in it. Spencer all by himself makes enough noise for any three other people. I will be glad when the travelers return home tomorrow. This was only the first day of a very stressful week. I really hope I make it through to Sunday night!